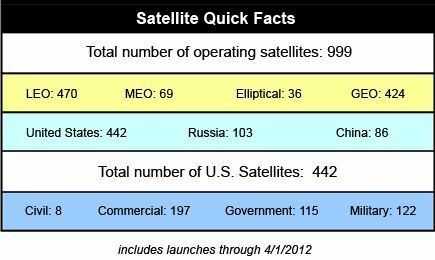 A new version of the UCS satellite database has been released, including launches and de-orbits through April 1, 2012. We added 13 satellites and removed 8, and the current count of active satellites is now 999. February 13, 2012 marked the inaugural flight of the new European Vega launcher, which is optimized to launch small satellites into low earth orbits. The launch’s primary payload, the LARES satellite is a 400 kg set of retroreflectors (and as a completely passive satellite, LARES does not appear in the UCS Satellite Database). Vega also carried eight student-built small satellites, including the first satellites ever for Hungary, Romania, and Poland. Four of those satellites, as well as Iran’s Navid, achieved orbit but also re-entered during the period this update covers, and so never appear in the database.